The latest updates, the greatest information, the Trolley Blog! Enter to win prizes from stores in Trolley Square during our 12 Days of Christmas Giveaway. Inside the Story: 102-year-old widow still working at husband's bookstore. She still shows up to work five hours a day, five days a week, at Weller Book Works, formerly known as the Sam Weller Bookstore. "I was married to the great Sam Weller," she said. (KUTV) Salt Lake City - Chef Josh Garcia, Co-Owner and resident chef at We Olive in Trolley Square, showed Dave Gunderson how to use high-quality olive oils to make a Thanksgiving side dish stand out. It's time to go shopping at Trolley Square! Trolley Square and vendors are more than exited to launch their "Weddings at Trolley Square" campaign. SALT LAKE CITY (June 23, 2017) – Trolley Square has launched their Weddings at Trolley Square marketing campaign with their first bridal fair event at The Falls Event Center at Trolley Square on June 23, 2017 from 5pm-9pm. The bridal fair will feature the Trolley Square vendors participating in Weddings at Trolley Square; The Falls Event Center, Vue Magnifique Photography, Payne Anthony, Tabula Rasa, The Old Spaghetti Factory, We Olive, Whole Foods Market, Rodizio Grill, Seasons by David, Williams-Sonoma, Pottery Barn and the Trolley Square Barbers; featuring live music from local jazz band Notes of Passage. Guest of the bridal fair will each receive a FREE copy of the Weddings at Trolley Square Complementary Wedding Planning Resource guide. Inside this guide couples will find helpful resources for planning their wedding including frequently asked questions, a general planning check list, questions to ask vendors and much more. These guides will also be available at Trolley Square and their participating vendors after the bridal fair. Trolley Square is Utah’s only festival marketplace, offering many one-of-a-kind shopping, dining, and service-oriented experiences to residents and visitors alike. With its origins dating back to 1847, the center is an historic landmark and a Utah treasure. For more information, including scheduled events, visit TrolleySquare.com or its social pages at Facebook, Instagram and Twitter. SALT LAKE CITY - Big plans are in store for Trolley Square. On Tuesday night, the Salt Lake City Council approved a zoning change that would allow for a hotel, housing units and more shops. The change is expected to revitalize the area as a premier shopping destination. "It's a great location and I think it's the midtown of Salt Lake City and it deserves to be better," said Khosrow Semnani, president of Trolley Square Ventures. Semnani said he knows personally how important this property is to the people living in the Central City neighborhood. "I used to live in this neighborhood many years ago myself, I lived on 6th East about 40 years ago," Semnani said. That's why he is so excited to move forward with a brand new development to be built across the street from Trolley Square on the corner of 600 South and 700 East, where a parking lot currently sits. "Architecturally it will be wonderful, it will be a total addition to the neighborhood, and it will compliment Trolley Square not only from a visual point but economically," Semnani said. The 3.5-acre mixed-use development will consist of six buildings that will be made up of apartment units, retail shops, a boutique hotel and underground parking. "It's time to do it, it's just that simple," Semnani said. People living in the neighborhood say it's much more complex. "There are some concerns we've heard from residents, specifically about the size and sort of the scale as compared to the rest of the street-scape," said Michael Iverson, Chairman of the Central City Neighborhood Council. Iverson represents thousands of residents and businesses in the area. He said they are OK with new developments as long as they fit in and don't stick out. "You know we are in the Central City Historic District, which is the oldest historic district in the city, and people are protective of that," Iverson said. The city planning department said nothing will be built without the approval of the Historic Landmark Commission. "They have been working on plans and throwing around ideas to take inspiration from the history of Trolley, which is wonderful," said planning manager Michaela Oktay. That history goes all the way back to The Utah Exposition Building in 1888, designs Semnani plans to incorporate into this new development. "We're excited to see how this project moves forward," Oktay said. The Historic Landmark commission is expected to vote on the project later this year, and, if approved, they would probably break ground at some point in 2018. SALT LAKE CITY -- After years of waiting, Google Fiber has officially launched in Utah's capital city. The Internet behemoth flipped the switch on its super high-speed network in Salt Lake City, providing service in the city center and opening the doors at its Trolley Square offices for people to sign up. While promising to expand and provide Internet service to the entire city, Google Fiber will have service available immediately in the downtown area and Central City neighborhood -- from 300 West to 1300 East and South Temple to 800 South. Access to the Fiber network depends on whether buildings gave Google permission to wire them. The rest of the city will come soon, said Google spokeswoman Angie Welling. "It's a matter of months, not years," she told FOX 13. "We're working as quickly as we can to make sure that sign-ups are open everywhere." Google said it would offer Internet service from 100 to 1,000 megabits (one Gigabit) per second, in addition to phone and TV service. Prices ranged from $50 a month for 100 Mbps to $140 a month for 1,000 Mbps and a TV package. Businesses were being offered Google Fiber packages ranging from 100 Mbps a $70 a month to 1,000 Mbps at $250 a month. Google Fiber said that as it expands throughout Salt Lake City, it would offer a $15 per month broadband program to bridge "digitally divided" neighborhoods -- those who have access to computers and Internet, and those who do not. Wayne Owen, who lives in Salt Lake City's west side, said it can't come quickly enough. "My current Internet provider, I'm not real happy with them," he said. "I'll be pleased to tell them their services are no longer needed." Since announcing Salt Lake City was a contender for its high-speed Internet service in 2014, Google Fiber has been eagerly anticipated by city leaders and consumers alike. Google Fiber will compete with other networks and Internet Service Providers, including Utah-based XMission, CenturyLink and Xfinity. CenturyLink said it has already spent more money on its network and offers gigabit service. "CenturyLink has proudly met the communication needs of Utahans for more than 100 years. We employ more than 1,500 Utah residents who are connecting fellow Utahans to the power of the digital world," the company said in a statement. "In the last five years, CenturyLink has invested approximately $500 million in its Utah network, expanding our fiber network and bringing faster Internet speeds to our customers. Since 2015, CenturyLink has offered gigabit service to residential and business customers in select locations in Utah." XMission founder Pete Ashdown welcomed Google Fiber to the city. 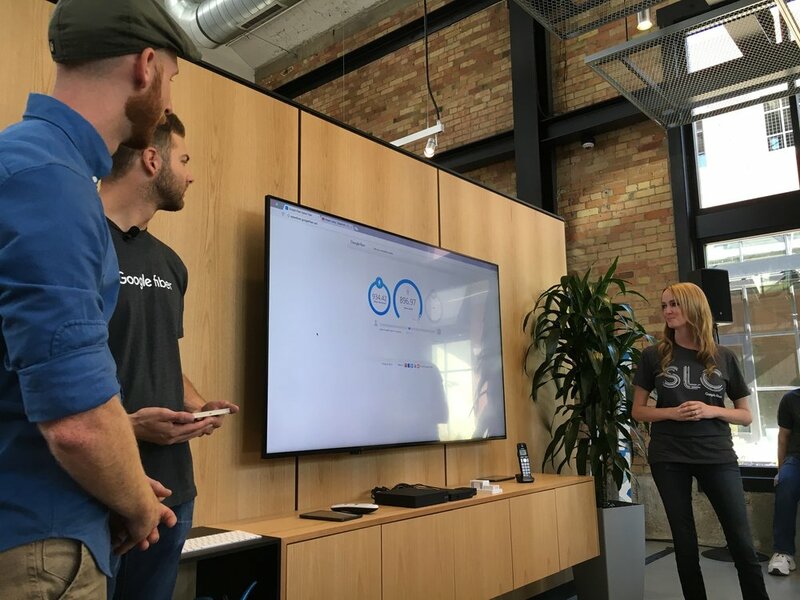 "XMission welcomes Google Fiber to help advance Internet accessibility to Salt Lake City residents. Although this is great news for select residents of Salt Lake City, XMission believes fiber is essential infrastructure to be managed by a neutral government and be available to any data provider," he wrote in an email to FOX 13. "Leaving this in the hands of one company gives less choice to the consumer and potential for monopoly." Welling said Google Fiber built its infrastructure from scratch, without taking any incentives from the city. Salt Lake City Councilman Stan Penfold said he believed Google Fiber's arrival would be good for consumers. "I think the competition is already very aware of what's going on," he said. "They've already improved their customer service, they've already improved their speeds. So it helps everybody." The project did not cost taxpayers anything to build, but the Salt Lake City Council gave Google permission to piggyback on existing city infrastructure. Google has refused to disclose how much it paid to build its network. FOX 13 has learned the company spent about $300,000 in building permits alone at Salt Lake City Hall. The Downtown Alliance, which markets downtown Salt Lake City, said Google Fiber will be a big lure for tech companies. "This is a huge selling point when you're talking to companies about why you should choose Salt Lake City over anywhere else in the country," said the group's Nick Como. Salt Lake City is the second city in Utah to get Google Fiber. Provo struck a deal with Google in April 2013 when the city council approved the sale of Provo’s existing network, iProvo, to Google for $1 a short time later. Welling said that as of right now, Google has no plans to expand in Utah beyond Salt Lake City and Provo. People of all ages gathered in front of Wellers Book Work in Salt Lake City for a Harry Potter Book Release Party put on by Salt Lake Comic Con. "We kinda wanted to give fans kind of a nostalgic party, I guess, for the new one that's coming out because it's highly anticipated," said Salt Lake Comic Con Community Outreach Director Britnee Bartlett. Coming almost 10 years after the 'Harry Potter and the Deathly Hallows,' fans have been eager to find out what Harry Potter has been up to after all these years and all grown up. 'Harry Potter and the Cursed Child,' is based off the stage play currently being performed in London written by Jack Thorne. The book was written by J.K. Rowling, Jack Thorne, and John Tiffany. The 8th installment in the Harry Potter World takes place 19 years after the events of the Battle of Hogwarts and follows the life of Harry , who is now working at the Ministry of Magic, and his son Albus Severus Potter. The launch party included everything from cos players, games, contests, magic shows, a Sorting Hat ritual for kids, panels and discussions, and so much more. Fans of the books had so much to do leading up until the midnight release of the book. "I never wanted to think that it was the end just because it was, it just seemed so never ending," said Emily Casselman. Guests also had the opportunity to purchase Salt Lake Comic Con tickets at the event which takes place Septemeber 1-3. Salt Lake Comic Con Co-Founder Dan Farr says, Harry Potter is such a big part of Salt Lake Comic Con and Salt Lake City. Salt Lake has some of the biggest Harry Potter fans in the world and they are looking forward to incorporate more of the magical world of Harry Potter at this years event. Farr also teased that an actor who plays a beloved character in the movies may be coming to Salt Lake Comic Con, but wouldn't elaborate more on who that might be, only saying we'd find out very soon. 'Harry Potter and the Cursed Child,' goes on sale July 31st, which also happens to be J.K. Rowling and Harry Potter's birthday's.